The starting point would be when your spade shovels are down which means your spade is closed. As shown in the photos, we measure widest point from top of spade shovels. With Red Boss Tree Spade, you eliminate the time-consuming task of changing loader sizes every time you need to increase ball capacity. You can dig, lift, and transport all in a single assigned work project; therefore, increasing production and decreasing labor costs at the same time. The self-sharpening blades are tempered steel and get harder every time you use the Tree Spade. Spades will dig the advertised ball sizes. Blades will never need sharpening! The majority of tree spades on the market today will always need sharpening. The shorter spade towers provide for minimal machine width which allows for digging trees in tight conditions. The hard bend on the back of each spade gives it more strength and helps to produce a ball that has a better fit in the majority of basket sizes. We do recommend 25 degrees truncated baskets. A 30-degree cone is available for use in sandy environments. 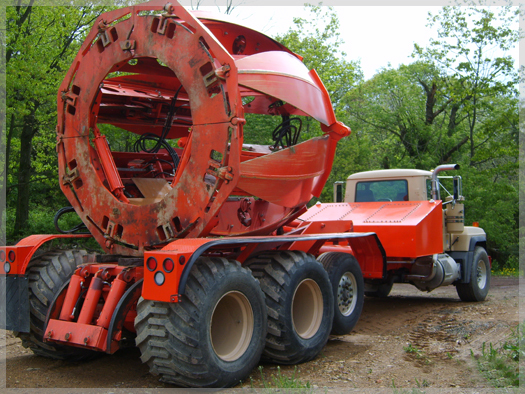 Better efficiency since the Red Boss is designed to achieve larger ball sizes without increasing loader size. Greater versatility gives the Red Boss a wider variety of balls sizes (ranging from 16 to 66 inches). Higher productivity is the result because the Red Boss digs more trees per hour. Spades that we manufacture are stronger, more durable, and will out-last any other brand of tree spade. All of these features make the Red Boss Tree Spade the ideal choice for your landscape and nursery needs.